One of the world’s toughest multisport race was challenging teams over 150km during 2 day stage multisport race last weekend 20th and 21th of January 2018. Over 85 team took part in the race with some visiting international stars from Australia and Sweden. Everyone races with two persons teams either Elite or Sport category. The course was the same for both categories. Race HQ (with finish line) was located by the beautiful lakeside of Wanaka. Spectacular race course travelled around all sides of this beautiful little town. The race is in its 4th year. The course is fixed in less there is bad weather. Both of the race days were extremely hot this time. Felt more like racing inside a sauna (note: writer is from Finland). Last year race the competitors were challenged by extremely cold weather. Weather changes here in New Zealand happen quickly and can be extremely powerful. Both days started early in the morning. Day 1 with the short bus and barge ride to other side of the lake. Atmosphere at the barge was happy and talkative, competitors were excited. The helicopter with media was flying around the barge to catch awesome photos. Day 1 race started with the 43km MTB which included various challenges…from hills, track, trails, holes on the road, creek crossing and some “hike with bikes” too. Next section after the MTB was 11km mountain run with very steep terrain with 60m abseil. Heat at this point was blistering. Sun came directly above your head and there was no shade. Last stage was 20km kayaking in the Lake Wanaka. Lake was really ruff with white caps. Wind was strong and coming from the side and tail depending what part of the stage you were. All the teams were racing in plastic double Barracuda kayaks. Second day started in the morning mist and in the calm lake paddling. This 20km kayaking stage included grade I to II rapids in Chutha River leading to Red Bridge, where 28km MTB stage started. This MTB leg had a bit of everything from asphalt to flower fields rides – climbed to 1300m mountain top follow by a steep downhill ride. During the MTB stage competitors were challenged with a special stop for shooting. Each one would get 1 clay-bird to shoot. In case clay-bird was missed; the penalty was to ride app. 2min circle. Last day’s course finishes with 28km run, which follows the ridge of the Mt. Alfa to Roy’s Peak right above the town. Elevation gain during this stage is over 1800m. One can only imagine the breathtaking views from height of that ridge in the middle of the Southern Alps. The race was easily followed with an online tracking link, when the phone had the internet coverage. The winners of the race were international multisport stars Braden Currie and Dougal Allan. There was not much competition over the leading position throughout the whole 2 day racing. Amazed how fresh they looked as they came to the finish line, smiling and giving high fives to the audience. Their finishing time was 12h14 with 50min lead to second team Hamish Fleming and Bobby Dean. 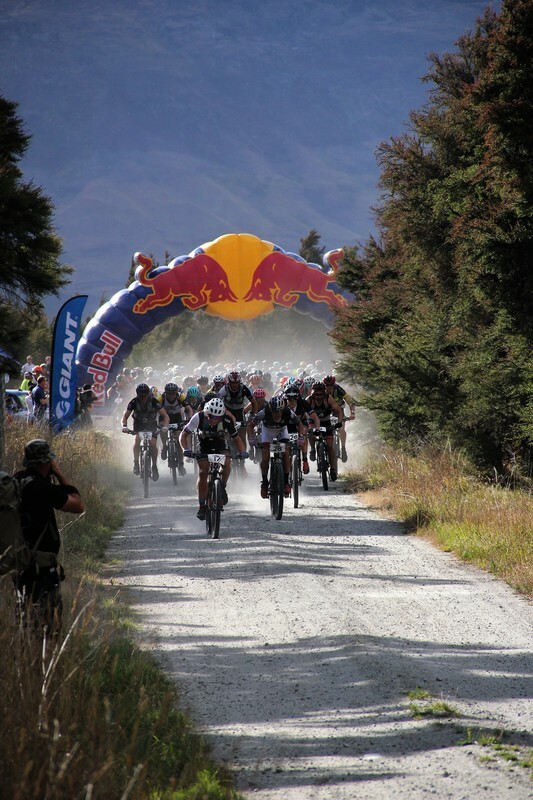 Mix team winners finish with their amazing 4th time victory in the Red Bull Defiance race. This honor goes to super couple Simone Maier and Marcel Hagener. Their team work is amazing. Effectiveness and strength can be seen in their every move with 110% focus. Finishing extremely strong and placing 3rd overall after 2 male teams with time of 13h18. The women category was filled with drama over the winning position. Winners of this year’s Elite category went to Denmark born Sia Svendsen and Josie Wilcox with the time of 16h36. These women pushed throughout the race, without knowing their position. Team received a happy surprise when they ran over finish line – they had won the race. Can you imagine that feeling! Congratulations to all the racing teams – you are all winners! The heat was blistering and the race course was challenging. The race was thought to be tougher than the Ironman, by many triathletes’ participants. Link to pictures can be found in the box below! Thank you for your smiles middle of your challenging racing - you really amazed me! You guys ROCK! !